Another Beautiful Day in Paradise. Well............... It was 59 degrees, everything was wet and a North breeze was blowing 10-20 mph. After very careful consideration we decided just to go to Georgie Boys for an early Brunch. 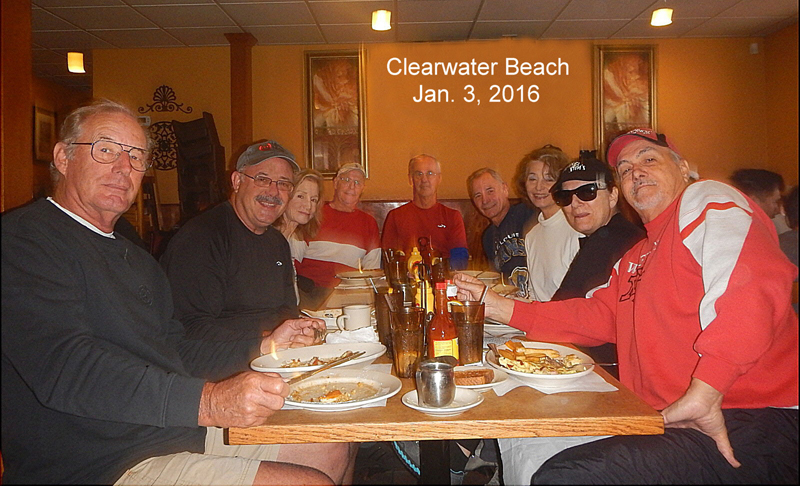 Bladers/Bicyclers Roy H, Rob H, Dorey Anne & Bruce M, Jeff B, Bill & Diane S and Ginnie & Rick came. Welcome all. It has been a busy time with our bladers and bicyclers renewing their Sponsorships. Since the last time I thanked everyone Bill S, Dennis & Ellen H, Diane L, Glenn & Sandy R, Glennis W, Jeff W, Linda S, Mike M, Monika R, Patricia K, Rob G, Rob H, Sumi R and Wendy H renewed their Sponsorships. Thanks all for the website and functions support. Rick and Ginnie went ahead and reserved us at table at Georgie Boys so we just walked in and sat down at a big table. Thanks Rick and Ginnie. The service was good, the coffee flowed so freely I drank too much (coffee) and the food very good as usual. We had ratings from 7.5 to 7.7 so we'll give Georgie Boys a 7.6.